Only showing entries about lajpal from Pintu's Firsts. View entries about lajpal from all Travellerspoint blogs. What does 2006 hold in store? The year 2006 will start with a trip to India. 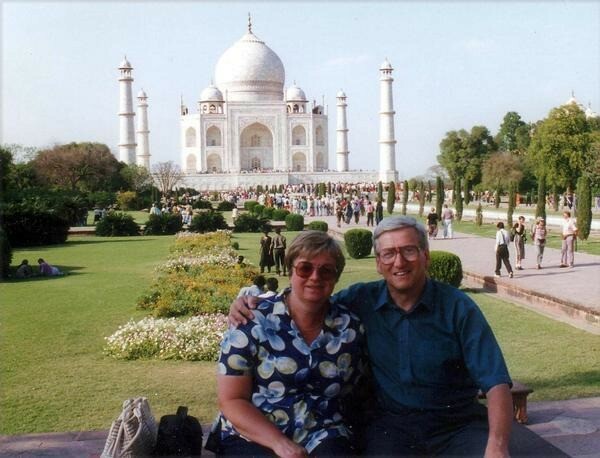 It’s a fascinating country and I’ve been fortunate to visit it on several occasions, most recently with my wife, Pat, to celebrate our Silver Wedding Anniversary in 1997. At the Taj Mahal in 1997 - After Delhi Belly and before Bombay Bum! We joined a group of Brits on a package tour of Rajasthan; I loved everything about it, but the trip was marred by Pat’s dislike of the taste and smell of curry! Plus, while we took all the usual precautions - peeling fruit, declining salads, brushing teeth with bottled water - we both ended up with humungous doses of Delhi Belly, Jaipur Jippy and Bombay Bum, and sometimes all three at once! We survived, but Pat’s never forgotten, nor forgiven. So, I’ll be on my own in India this time. I say ‘on my own’, but only on the way there and back. Within India, I’ll have the unusual opportunity of being accompanied for much of the time by a young man we encountered on that visit eight years ago and whose education I’ve helped to support since that time. Life is like an ice-cream!